Whenever I speak to aspiring referees who have ambition to make it to the PRO level, they tell me that they watch MLS and other top leagues around the world to study referees at the very top; to learn from their characteristics and incorporate into their repertoire any trait that they think will improve their own refereeing, particularly in terms of positioning and managing players. The smart ones, however, will want to know how our referees prepare for the games. When they discover the preparation and personal sacrifices that professional referees must make to be successful, they are often surprised. If they cannot make the commitment that is required, they will never progress. In terms of preparation, they must submit daily training data to the sports scientists. This covers physical training and levels of fatigue. They must also attend regular training camps and have sessions with the sports psychologist which deal with mental training. There are also sessions with our nutritionist to ensure they are given the correct dietary advice. Moreover, they must balance their lifestyle in order not to neglect their families or their regular employment if applicable. They also have a scouting report prior to the game, where they can see tactics and traits of players and teams to assist their knowledge of how to manage certain players and where to position themselves in certain situations. All this preparation will culminate in their performances on the field of play, when referees walk out on the field, not only physically, but mentally prepared. The mental part is just as important – we have seen referees who are not mentally prepared miss or fail to make correct calls in the first five minutes as they are not focused, or they lack the strength to make a game changing call; or indeed in the last five minutes as they are physically and mentally exhausted and switch off. In Play of the Week 18, we are looking at a play in the second minute of the game where referee Chris Penso, who is no stranger to making big calls in the first two minutes, awards a PK. 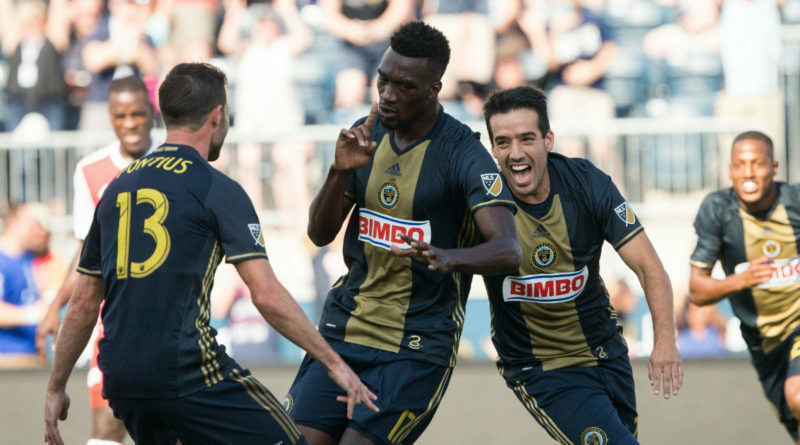 The play is from the game between Philadelphia Union and New England Revolution. As play develops towards the left edge of the penalty area, Penso is aware that he needs to be in a wide position, level with the edge of the penalty area parallel with the touch line. He knows that none of his crew can assist him in this area. He sacrifices distance for angle as he knows the importance of seeing whether an incident occurs in or out of the penalty area. When Union’s C.J. Sapong attempts to cross the ball, he can see that the arm of Revolution’s Benjamin Angoua is in an unnatural position and stops the ball being crossed. Penso awards the PK in a confident and assured manner and as it is so early in the game, defenders are frustrated that they have given away a PK and some complain. Penso remains calm and resolute, and initial protests are quickly over. Finally, he remains diligent and uses proactive management to warn players not to encroach into the penalty area. So to any aspiring referee: yes, please look at the impressive list above that you can apply in your games, but remember it is the PREPARATION that will enable you to do it. Copyright © 2019 Professional Referee Organization. All rights reserved.